The question of how light travels through space is one of the perennial mysteries of physics. In modern explanations, it is a wave phenomenon that doesn't need a medium through which to propagate. According to quantum theory, it also behaves as a collection of particles under certain circumstances. For most macroscopic purposes, though, its behavior can be described by treating it as a wave and applying the principles of wave mechanics to describe its motion. In the mid 1800s, Scottish physicist James Clerk Maxwell established that light is a form of electromagnetic energy that travels in waves. The question of how it manages to do so in the absence of a medium is explained by the nature of electromagnetic vibrations. When a charged particle vibrates, it produces an electrical vibration that automatically induces a magnetic one -- physicists often visualize these vibrations occurring in perpendicular planes. The paired oscillations propagate outward from the source; no medium, except for the electromagnetic field that permeates the universe, is required to conduct them. When an electromagnetic source generates light, the light travels outward as a series of concentric spheres spaced in accordance with the vibration of the source. Light always takes the shortest path between a source and destination. A line drawn from the source to the destination, perpendicular to the wave-fronts, is called a ray. Far from the source, spherical wave fronts degenerate into a series of parallel lines moving in the direction of the ray. Their spacing defines the wavelength of the light, and the number of such lines that pass a given point in a given unit of time defines the frequency. The frequency with which a light source vibrates determines the frequency -- and wavelength -- of the resultant radiation. This directly affects the energy of the wave packet -- or burst of waves moving as a unit -- according to a relationship established by physicist Max Planck in the early 1900s. If the light is visible, the frequency of vibration determines color. The speed of light is unaffected by vibrational frequency, however. In a vacuum, it is always 299,792 kilometers per second (186, 282 miles per second), a value denoted by the letter "c." According to Einstein's Theory of Relativity, nothing in the universe travels faster than this. Light travels slower in a medium than it does in a vacuum, and the speed is proportional to the density of the medium. This speed variation causes light to bend at the interface of two media -- a phenomenon called refraction. The angle at which it bends depends on the densities of the two media and the wavelength of the incident light. When light incident on a transparent medium is composed of wave fronts of different wavelengths, each wave front bends at a different angle, and the result is a rainbow. What Is Light Measured In? 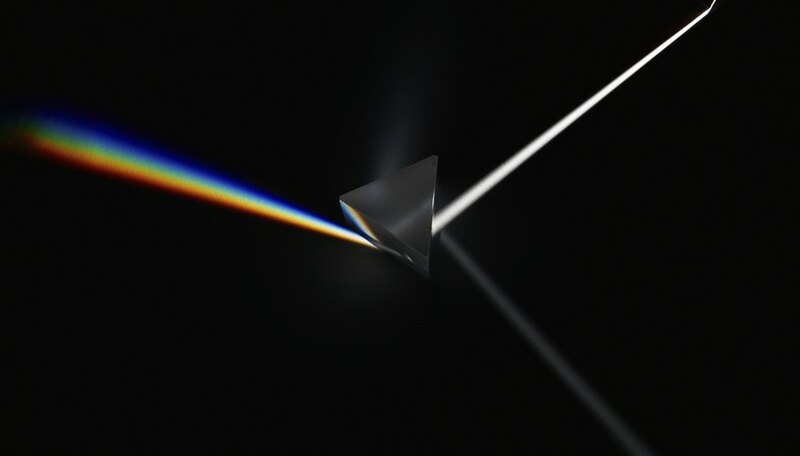 What Happens to a White Light When It Passes Through a Prism and Why? Deziel, Chris. "How Does Light Travel?" Sciencing, https://sciencing.com/light-travel-4570255.html. 24 April 2017.